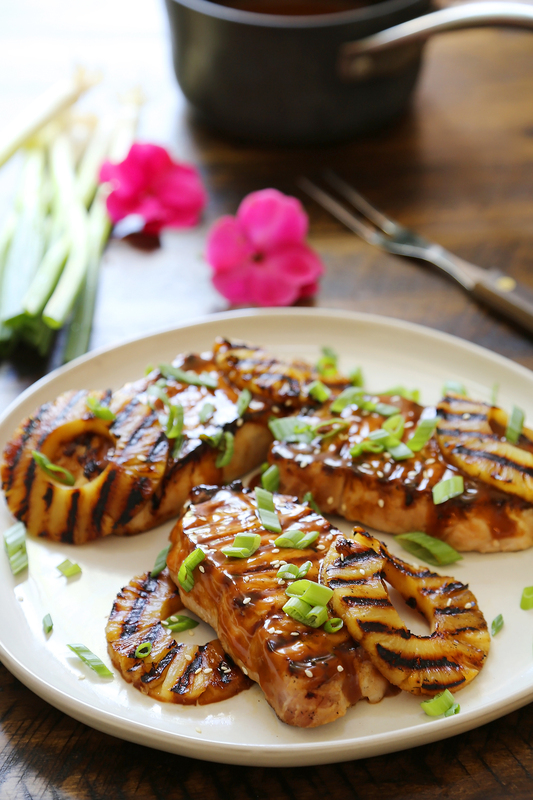 Juicy, tender grilled pork with a salty-sweet garlic ginger sauce! Change up your usual weeknight flavors with this mouthwatering family-friendly meal. Serve with peanut noodles or a fresh corn salad on the side! ‘Tis the season to fire up the grill! We love recipes like this, that keep the heat out of the kitchen and the flavor in our meals. 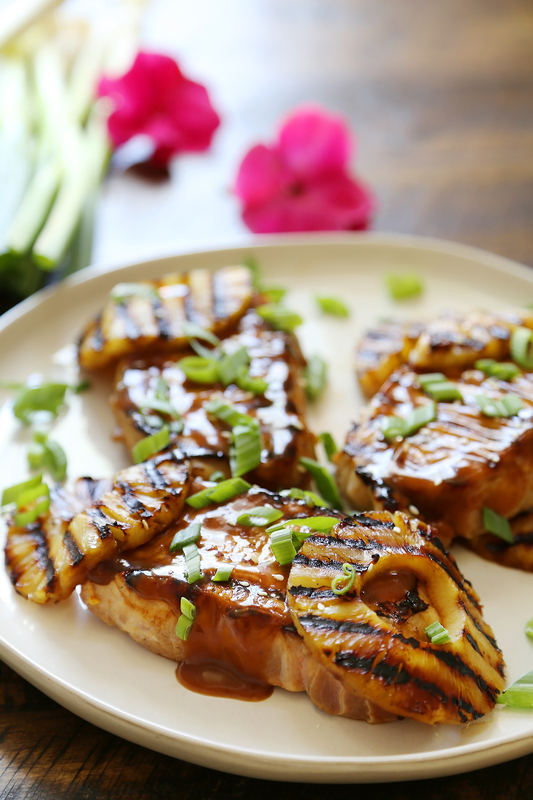 This easy Hawaiian pork has been an exciting flavor twist and inexpensive meal that the whole family enjoys. The combination of sticky-salty-sweet smokey goodness with the grilled pork makes for mouthwatering forkfuls. Served with a bowl of Soy-Peanut Noodles and scoop of Texas Caviar, it’s pretty much summertime perfection on a plate. We love serving this on both weeknights and for dinner with a hungry crowd of friends! The recipe is simple, so let’s get cookin’! It starts with a marinade (which you will later use to make a sauce). Add the pork to the marinade, and let sit for at least 20 minutes, or up to 1 day. I went the 20-minute route this time, and still had a very juicy and tender pork chop! Remember, don’t discard the marinade when you are ready to the cook the chops. 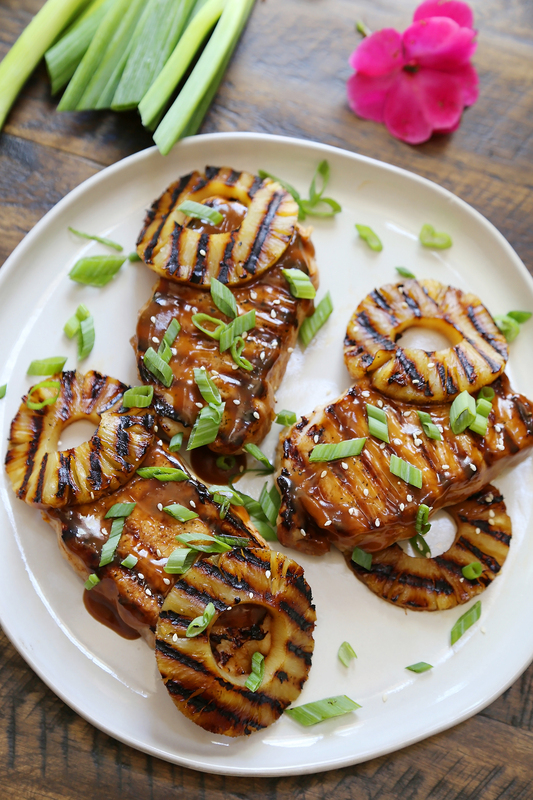 To a roaring hot grill, add your pork and pineapple rings, and cook on both sides until you achieve a nice char. Meanwhile, your leftover marinade bubbles in a saucepan, thickening into the most delicious sticky sauce for drizzling on the cooked pork. Sprinkle some green onions on top, and you’re ready to serve! Add pork chops to a medium bowl. In a separate bowl, whisk garlic, soy sauce, brown sugar, ketchup, sesame oil, red pepper flakes, ginger and pineapple juice. 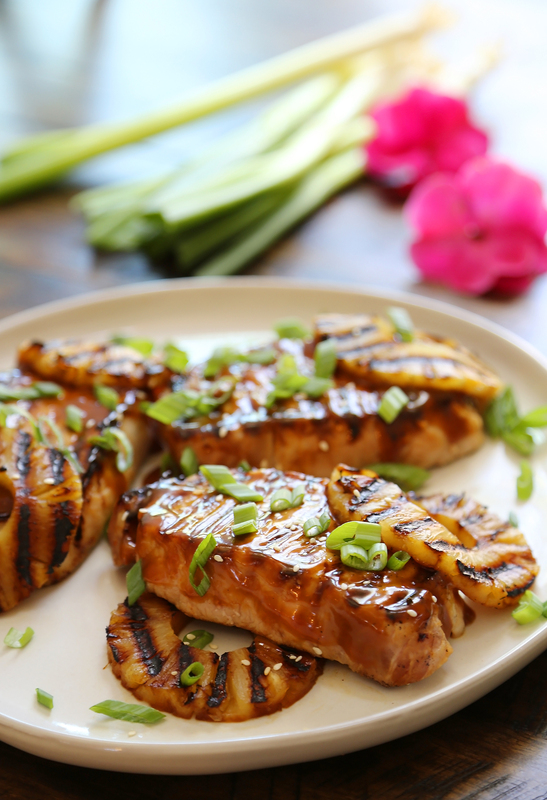 Pour marinade over pork and let marinade for at least 20 minutes, or up to 1 day. Heat an indoor/outdoor grill to medium-high. Coat with nonstick cooking spray. Remove pork from bowl (reserve marinade to make sauce). 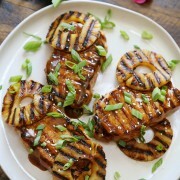 Arrange pork and pineapple rings on grill grates and cook 4-5 minutes on each side, depending on thickness. Remove from grill and let rest. Whisk cornstarch into marinade and strain into a sauce pan set to medium heat. Bring to a boil, then reduce heat to Low and simmer sauce until thickened, about 3-4 minutes. Drizzle pork chops and pineapple with sauce. Sprinkle with green onions.